Last Christmas I did something a bit different when it came to sending out our family Christmas cards. I decided to use Shutterfly and create a gorgeous and personalized card. This card that I created was a huge hit with everyone who received it and I cannot tell you the compliments that I received on it. My sister still has it displayed on her refrigerator! So, it is no surprise that this year, I am going to use Shutterfly once again and create another card that will be sure to impress and send lots of joy to our loved ones. Today, I am going to share a few of my favorite products from Shutterfly, including some stunning holiday cards that are sure to make this coming season bright!! 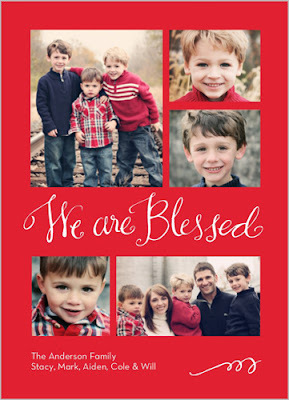 My first choice when it comes to a favorite Christmas card would be the We Are Blessed card. I love the colors and yes...with two beautiful children and another on the way, we are definitely VERY blessed!!! I love how you can use multiple photos to create a beautiful collage. I am a huge picture taker so I have LOADS of pictures that would look great in this particular layout. Along with holiday cards, Shutterfly also has some wonderful photo gifts that would be perfect for a grandparent or other family member. 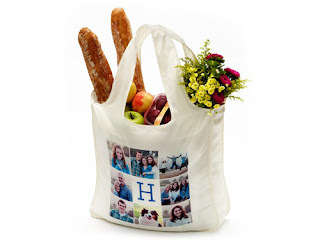 Check out this cute shopping bag...can't you see yourself plastering photos of your children all over it and giving it to grandma for Christmas? I can! So, as you can see there are tons of options when you choose to use Shutterfly. I am really excited about getting my Christmas cards this year and am even more excited to hear how everyone loves them!! By the way...are you a blogger? Want a chance at 25 free cards this holiday season? Register here: http://goo.gl/DDw7Q . Visit Shutterfly and then come back here and tell me which holiday card is your favorite. :) You do not have to be a blogger to enter, but you must have a valid email where you can be reached should you win. If you do not leave an email address, it must be where I can easily find it. This giveaway is open to US residents and will end 11/9 at 11:59 pm EST. The winner will be chosen using random.org and will be notified by email. The winner will have 48 hours to respond, or another winner will be selected. 1. "Like" Shutterfly on Facebook. 2 entries, so 2 comments. 2. Follow Shutterfly on Twitter. 2 entries, so 2 comments. Disclaimer: I received no monetary compensation for this post. However, I did receive free 50 free Shutterfly cards in exchange for this post. All quotes and stock photos are from the Shutterfly website and email. All thoughts and opinions are 100% mine. Eight Birght Nights Hanukkah card is my favorite !! I like the Classic Holly Frame Christmas Card. 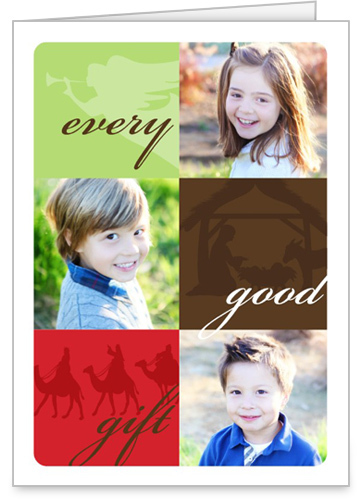 I like the Berry Merry Frame card. I love the Snowflakes ribbon. tweeted today. i figured out how to log in for comments and not be anonymose. i'm loriquesinberry@yahoo.com that has posted prior. I like We Are Blessed too. Or any of the religious cards in a flat style. Thanks! I follow Shutterfly on Twitter. @womenwwin. Heavenly Snowflakes Religious Christmas Card. I'd choose the Merry Bright Greeting. You have just voted for In My Opinion. I like the Count Our Blessings Card. I like the family tree card. My favorite is the Sparkle Joy Holiday Card. I like the Merry Bright Zigzag card! Love the snowflake cards or the red dots. I like the Mod Circles Christmas Card. I love the Joyful Joyful Cards! #1 I like shutterfly on facebook! #2 I like shutterfly on facebook! #2 I follow shutterfly on twitter! I like the Very Merry Montage. I like the O Holy Night design. Thanks. I like Golly Holly Joy. My favorite is Snow friends! So cute! Love so many of them! Especially the "Pretty Pattern" design! I really like the 'Happy Joy' card. Thank you for the giveaway! I like the O Holy Night Design! Thanks so much for the fantastic giveaway! I follow Shutterfly on Twitter as Renee Walters1! Thanks so much for the fantastic giveaway! I like Shutterfly on Facebook as Renee Walters! Thanks so much for the fantastic giveaway! The holiday cards I like is Joyful Joyful Merry Christmas cards.